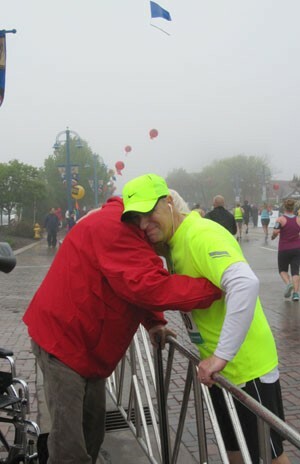 My parents drove up to Duluth early Saturday morning to surprise my brother at the finish of his first marathon. With great anticipation, we waited in the rain for him to turn the final corner. Cameras ready and cow bells ringing, Tina, Emily and I were cheering to get his attention and then pointed out Mom and Dad. John’s mouth dropped and he stopped in his tracks to embrace Dad. Emily brilliantly captured the moment, summing it all up. Family, friends, love, unwavering support, being there in the rain to celebrate our wins, easing the heavy steps all make the long race possible and meaningful. The finishing touch to the journey well traveled, never alone. So well written about family and friends being there for the good and especially the hard times. The photo shows the love between dad and son….awesome! Thanks for introducing me to half marathons and marathons Jeanne – won’t be catching your 26 marathons! What a beautiful post – I love the Thomas Merton post. Thanks – it was a special weekend. Well. I can cross “shed tears” off of Monday’s to-do-list now.